It’s safe to say the industrial look is here to stay. Many of the highlighted materials included in the style are the same ones that have been used in construction for over a hundred years. The difference now is that we don’t put a façade over them but rather allow the iron, steel, and concrete to show off all their natural appeal. But that doesn’t mean they need to look raw or unrefined. Polished concrete floors are sleek and elegant, and blend with almost any design style for your home. Actually, this is a lot of work with a lot of equipment that merits a step-by-step article of its own. Your average DIYer should start with an existing slab. If you're an advanced DIYer starting your building project literally from the ground up, make sure you have all necessary permits in hand before starting. Mark out the boundary of your slab, check the level and excavate as necessary. Create a solid base of compacted gravel. Frame out the form with dimensional lumber. You may need rebar reinforcements, especially on the perimeter. Pour the premixed concrete into the form. Distribute the concrete into all the areas of the form. Screed it level to the top of the form using a 2x4. Use an edger to round the edges of the slab. Cut in control joints with a straight edge and a groover. Let the concrete cure a little longer, then use a float to smooth it further. The concrete should continue to cure for 3-4 days, and can be misted with water and covered with plastic to keep it from cracking. After this point, remove the form, build a room around it and get to polishing. If you’re poured your own slab it should be in pretty good shape, but if you’re polishing a pre-existing piece of concrete, this is the time to check things over for repairs and maintenance. Any large issues, like dried construction adhesive, should be removed at this time.The polishing process will create a lot of dust, so it’s best to keep things clean. Make sure the room you’re working on is properly separated from the rest of the living area with dust barriers. If there’s already a finish on the concrete, it will be removed by the first pass with a concrete polisher. This tool is a walk-behind machine with sanding and polishing discs spinning at the bottom. It's rentable from many home stores. Make sure you get one with an attached vacuum for dust control. The polishing of the concrete starts with the heaviest grit metal bonded diamond disc. This will remove any finishes and small flaws on your slab. Take your time with each pass, overlapping slightly so there are no bare patches. This method will be the approach for the entire process. Once the first pass is finished, inspect for more flaws exposed by the grinding. Use epoxy concrete repair to fill any cracks or blemishes. Now that the first pass on the slab is done and the flaws are repaired, it’s time to work your way through the metal bonded diamond disc grits, going from heavy to light. Again, take your time with each pass, keeping an eye on how the surface is being removed. You may need to replace the discs in order to keep things fresh before you’re ready to step down to the next level. If the polisher you rented doesn’t get all the way to the edges of your room, you’ll need to rent a separate edger so everything is even. Like everything else in this process, don’t rush and don’t skip a step. Because the polished look is so refined, it’ll reveal where you’ve skimped. Continue on with the metal bonded discs, using finer and finer grit until you get the concrete to the desired level of smoothness. With the heavy grinding done you're almost ready to move on to polishing. But before that, there’s an important step that will add years to your polished concrete, and make it much easier to maintain. A liquid concrete densifier should be applied to the entire floor. This material soaks into the concrete, bonding with it and making it more dense. This surface is harder and will take a polish more readily. Once the densifier is dry, mount the polymer bonded diamond discs to the concrete grinder and start polishing. Like the last process, go down from heavier to lighter grits, taking your time with each pass, until the concrete reaches the desired level of polish. Now that your floor is at the level of shine desired, you can apply a concrete sealer. This step is optional because the slab should be quite hard from the densifier, but the sealer will help in keeping the concrete clean. 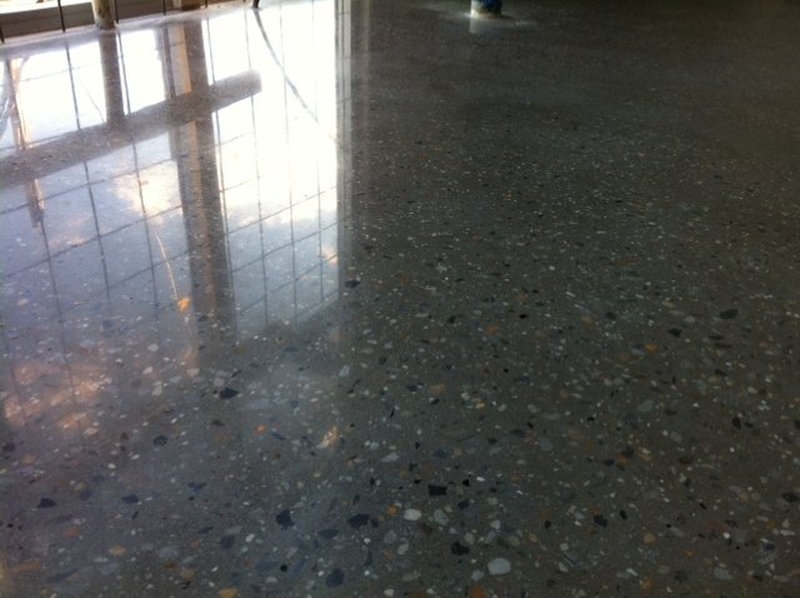 Maintaining your polished concrete is simple. A microfiber cloth sweeping can take care of light dust and dirt. Wet mopping, either with clear water or a floor cleaner, can be used for heavier trafficked areas. Other than that, the concrete should give you years of durable use. A simple process can take a basic building material like concrete and make it shine, producing a durable design element that can fit with nearly any style. Server responsed at: 04/20/2019 6:42 p.m.